The South African National Biodiversity Institute (SANBI) leads, coordinates research, monitors and reports on the state of biodiversity in South Africa. The Institute is mandated to provide knowledge and information, planning and policy advice, and to pilot best-practice management models in partnership with stakeholders to support the sustainable use of the country’s biodiversity. Giving effect to this mandate, SANBI plays an important role in supporting the translation of science into policy. The exploitation of shale gas in the Karoo is considered potentially important to South Africa’s economic growth and may reduce the negative impacts of traditional coal-generated energy (Wait & Roussow 2014). The amount of recoverable shale-gas in the Karoo is amongst the largest in the world, at ca. 11 trillion m3 (Shale gas development media release, 2015). The Karoo has a historically low human population and little land transformation, so its unique biodiversity is essentially intact. The shale gas development opportunity therefore poses a threat to South Africa’s biodiversity, perhaps one of the largest in the country’s history, as shale gas exploration applications currently cover 125,204 km2. Exploration, development of wells, and the road/refinery infrastructure associated with shale gas extraction may result in extensive loss of natural habitat, with detrimental impacts on sensitive species as a result of sound and light pollution, and ancillary effects including pollution and abstraction of ground and surface water. The Karoo is also targeted for other development: Uranium mining in the Beaufort West area; Renewable energy systems (solar & wind farms); an expanded power grid system; and the Square-Kilometre Array radio telescope. Multiple infrastructure development projects in the Karoo show that the area is strategic, but current biodiversity data must be upgraded and knowledge gaps filled to minimise risk associated with these developments. The biodiversity of the Karoo, especially the Whitehill Shale Formations (the area with the largest recoverable shale gas deposit) is poorly surveyed. Around 50% of South African species are endemic, and many are found only in the semi-arid Karoo. A lack of sampling means that data are inadequate to inform responsible development, and that monitoring future impacts on species diversity and ecosystem function is not achievable. The data that exist for the region are fragmented and lack quality control. Basing decisions on existing data is therefore risky, particularly in the short timeframe expected. South Africa is a signatory to the Convention on Biological Diversity (United Nations, 1992), and has committed through the Constitution (Statute No. 108, 1996) and the National Development Plan (National Planning Commission, 2012) to protect the environment. It is essential that shale gas exploration and extraction is done in a responsible manner that draws upon knowledge of the biodiversity that will be impacted. Scientific studies are therefore necessary to comprehensively survey the area to ensure increased geographic and taxonomic coverage that will allow us to map species ranges, identify important habitats, and classify wetlands and rivers – all of which will support decision-making. With this understanding, SANBI led a consortium of institutions to a successful funding grant from the National Research Foundation (NRF) Foundational Biodiversity Information Programme (FBIP). 2) conducting detailed surveys for 11 representative taxonomic groups in areas targeted for shale gas exploration. The 11 taxonomic groups are: plants, mammals, fish, amphibians and reptiles; as well as six invertebrate groups: bees, dragonflies, grasshoppers, scorpions, butterflies and spiders. Establish a coordinated network of institutions to deliver foundational biodiversity information to decision makers. Produce comprehensive high quality occurrence data for target taxa through national level specimen digitisation and field sampling within the shale gas development zone. Enable species identification through DNA barcoding and develop a barcode library with applications in biodiversity monitoring and assessments. Assess the threat status of species to identify those of conservation concern (e.g. endemics, near endemics and functionally important species). Conduct research to identify core areas and habitats for species of conservation concern occurring within the Karoo, and assess functional diversity to be used as a baseline for monitoring ecosystem services and function. Compile and serve species data and associated landuse guidelines to decision makers at the international, national, provincial and local levels. Upskill young scientists in terms of data collection, field surveys, data management, analyses, and threat assessments through practical work and post-graduate studies. - Collections institutions that will be involved in digitisation and specimen curation: Selmar Schonland Herbarium, Port Elizabeth Museum at Bayworld, Bews Herbarium (University of KwaZulu-Natal), Bolus Herbarium (University of Cape Town), Compton Herbarium (SANBI), Ditsong Museum, Iziko Museum, and National Museum. - Universities that will be involved in surveys and co-supervising postgraduate research (Objectives 5&7): KwaZulu-Natal, Cape Town, Stellenbosch, North West and Pretoria. - DNA barcoding work will be a joint effort between SANBI, the National Zoological Gardens and the University of Johannesburg (Objective 3). - Species threat assessment work (Objective 4) will be supported by the NGOs the Botanical Society of South Africa and the International Union for Conservation of Nature (IUCN). End-users supporting government decision making are the Council for Scientific and Industrial Research’s Environmental Management Services, DEA’s Integrated Environmental Management and Support Directorate, SANBI’s Information and Policy Advice section, provincial environmental authorities (Eastern Cape, Northern Cape and Western Cape) and local municipalities (Objective 6). The project provides research opportunities for 11 young scientists, and will train at least seven students. It also pilots novel approaches in engaging and developing citizen scientists. By the end of the project approximately 200,000 new primary occurrence records will inform species occupancy and habitat richness models which, along with approximately 300 Red List assessments of species of conservation concern, will be served to decision makers via the SANBI’s Land Use Decision Support (LUDS) tool. The project will contribute a large amount of material to natural science collections which can be used for taxonomic research. The data collected will also contribute to future National Biodiversity Assessments and possibly also to improving ecosystem classifications and vegetation mapping. 1) Field surveys of 30 compulsory and 20 optional sites; each site to be visited at least twice. 2) Datasheets containing details of all records collected in the field. 3) Total records of at least 500 butterfly new primary field presence or presence/absence records, fully digitised and in a format up-loadable to the Specify Database or already loaded in Specify. 4) DNA samples of butterfly species for barcoding (to total 240 butterfly DNA samples by end of project). 5) Progress reports on fieldwork undertaken, identification and storage of field-collected specimens (January 2017, March 2018 and December 2018). 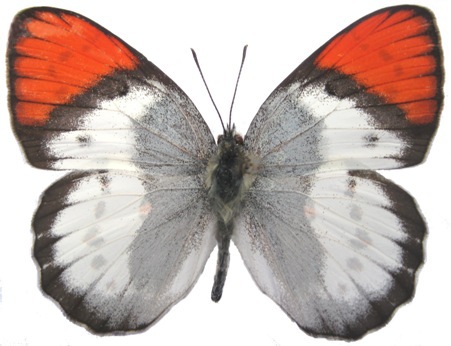 7) Any butterfly records from the Karoo region posted on iSpot and ADU virtual museums to be identified. 8) At least 10 Red List assessments for butterflies (or checking and updating of current assessments). 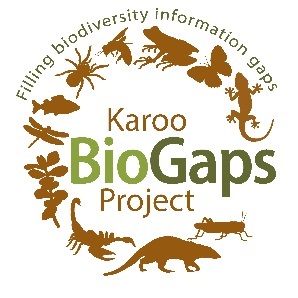 9) Contribute to one (1) peer-reviewed scientific paper submitted to journal(s) for publication as required by Principal Investigator of Karoo BioGaps Project. 10) Species pages (or updates) for 20 butterfly species to be submitted via SANBI’s species page portal. 1) The basic site sampling design and selection process has been done by SANBI personnel. The survey sites have been designated as being either “compulsory” or “optional”. There are 30 “compulsory” and 20 “optional” sites. 2) Each sample site is a 1km x 1km square, the centre of which is defined by GPS coordinates, situated within a pentad (5min x 5min square) and a quarter degree (15min) grid square (QDGS). 3) The sample sites have been selected to contain a diversity of habitat types such as flat areas, slopes, ridge or hilltops, and (ephemeral) watercourses. 4) Each butterfly surveyor has been allocated a number of the “compulsory” survey sites by the taxon lead for butterflies. These sites should be explored in more detail using Google Earth before going out into the field. 5) The sites allocated to each surveyor have been “clustered” so that they can all be surveyed during a single multi-day trip, thus minimising the amount of travelling time and expense. 6) During a trip the allocated “compulsory” sites should be done first. If time still remains for the trip nearby “optional” sites can be surveyed. 1) The butterfly records currently present in the Virtual Museum for the Karoo BioGaps area have been analysed into calendar weeks, for all species and for “special” (endemic and threatened) taxa. 2) From this analysis it is apparent that the period from late September to early December has yielded the most records of “special” taxa, and this would be the best time to do surveys. 3) However, the most critical factor to ensure a good survey is that there should have been reasonably good rainfall in the area within the last week or so. 1) Using data available in LepiMap, iSpot and from the SABCA project, a checklist of the species most likely to be encountered in the Karoo BioGaps study area is available. 2) Whilst it is possible that other species may be encountered, surveyors must ensure that they have good evidence for their observation such as a (pinned) specimen, a DNA sample or photographs good enough to make a definitive identification. 1) The surveyor should contact the landowner, arrange for which dates are most suitable, and reaffirm that permission is granted to enter the property, before he/she commences the survey. 2) The surveyor should arrive at the survey site (centre defined by the GPS coordinates) as early as possible (aim for 9am). 3) Record the site conditions (weather and veld condition) on the “site metadata” section of the datasheet. 4) Appraise the site and decide which areas look the most promising for butterflies (usually higher ground such as hilltops and ridges around midday; north or west facing slopes; water courses – especially in arid areas). 5) Estimate the extent of the survey site by remaining within 5–600 m of the centre point. Most GPS’s have a facility to see how far your waypoints are apart. 6) If the surveyor believes that the allocated 1 km x 1 km area has been adequately covered he/she can explore further in the vicinity. 7) If the weather conditions are good the survey should continue until about 3 pm, or until no further activity is observed. 1) Refer to the field records datasheet and metadata – the “surveyor’s data (observations)” section. 3) Records may be based upon visual observations, photographs or physical specimens. 4) The (provisional) identity, time, basis of record, count, life stage, habitat, GPS coordinates, accuracy and altitude (optional) of each observation are recorded in a small field notebook, then transferred to Appendix 8 later. 5) In case of multiple records of a single taxon, record each sighting so that an overall count can be made. Only one line entry is required, unless the sightings are a significant distance apart. 6) Photographs should be sorted, identified by the record number and as a species or subspecies (if possible) and stored on your computer when you reach home base. Copies of the best photos should be sent to iSpot for confirmation of the identity. 1) Fill out the “specimen processing” section of the field records datasheet. 2) Full butterfly specimens are inserted into collecting envelopes in the field, with the record number. Do not use ethyl acetate to kill specimens (it can degrade the DNA) – stun the specimen in the field by squeezing the thorax gently, and kill later by freezing. 3) On return to home base, samples for DNA analysis must be kept fresh in a freezer and placed in propylene glycol preservative as soon as possible, and kept in the freezer until a batch is ready for posting. 4) In order to process the specimen (sample) as a DNA sample, cut off its wings and place the body, or part of the body, e.g. thorax, into a small (2ml) leak-proof vial, filled to the near brim with preservative. 5) A small label written in pencil is inserted into the vial identifying the specimen with a unique code (your initials followed by 001, 002, etc.). 6) If the specimen is being set for inclusion into a pinned collection, just remove the leg(s), torn off at the base of the thorax, and place the leg(s) into preservative. Also add the BioGaps identifier code to your labelled pinned specimen (as well as its collection number) for future reference. 7) If there is some uncertainty about the identification, retain the wings in a small paper envelope, marked with the unique identification code. 8) DNA samples can either be posted in padded envelopes, but preferably packed inside a small cardboard box, particularly if there are a lot of samples. A print out of the spreadsheet that describes the samples in full must be included with the samples. 9) Post to: D A Edge, PO Box 2586, Knysna, 6570, using tracking. Send him an email when you post a parcel, with the tracking number. Postage costs will be reimbursed. Please note that our secure online payment facility with Payfast has been successfully launched and you can now pay your membership subscriptions via PAYFAST or EFT. Register, link your card, and swipe your card at every MyPlanet registered store. Existing card holders can support Lepsoc in addition to their current beneficiary.